I was feeling a whole range of emotions when I first heard of the redux film project that is the 2009 rehashing of the 1980 CLASSIC, Fame. I have tended to vacillate between pure excitement for the movie, which will hit theaters in the US on September 25th, and complete dread. Excitement because it's Fame, one of the best 1980's films period, one of the best musicals period, one of the best movies about accomplishing your dreams period. Dread because it is 2009, and the cast is drenched in "up and comers" that range from the lead singer of V Factory and a former member of 3LW (yay!) to c-list Disney actors (yay?). For those of you who are unfamiliar (for shame!!!! 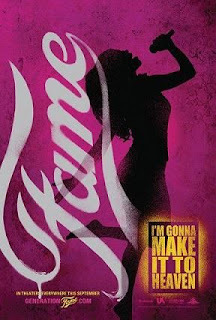 ), "Fame" is the story of a group of kids attempting to pursue their artistic dreams at a high school in New York City, that is based on a real (and still thriving) high school here in the City (now known as LaGuardia High School of Music & Art and Performing Arts). I even had some friends in college who attended. There are days when I have an overwhelming fear that this will be unacknowledged fluff in a vain attempt to be "High School Musical, Part 16". The story is so important, so real, so relatable and so New York, that if I am even the slightest bit dissapointed (and I know I will be on some level), it will be very very upsetting. But it's easy to say that this project is the one soundtrack I was most looking forward to this year. The soundtrack was released to stores this past week, and for the most part, I'm on board. It's one of those musical soundtracks that straddles the line between traditional soundtrack and contemporary "Broadway" soundtracks, as it contains tracks by Santigold, Anjulie, Sam Sparrow, A'ksent and Tynisha Keli, as well as film "numbers" featuring the movie's stars (mostly V Factory's Asher Book and Naturi Naughton, formerly of 3LW). The big judgement factor came when you realize they have re-do the film/musical's two signature songs: "Fame" and "Out Here On My Own", which were both sung by the incredible Irene Cara in the original film. Naturi Naughton tackles them both, and I have to say she does them with considerable style and grace. She puts her own flare on them without smudging the original, which is quite difficult to do, and it truly shows how much she was snubbed by her "Cheetalicious" former bretheren in 3LW, as her vocals were very much on point. I particularly love her cover of "Fame", as I'm so partial to that song to begin with, and they made it sound very '09 dance/urban/pop, which I'm guessing is the main attempt with this film. However, it goes without saying that she deserves serious props for the vocally difficult "Out Here On My Own", for her incredible vocal control alone. Asher Book's include a cover of John Legend's "Ordinary People", and the classic "Someone to Watch Over Me", which has been performed by a laundry list of remarkable performers, including Frank Sinatra and Ella Fitzgerald. His vocals leave a little bit to desired, because when you think "Fame" (or at least I do) you think of earnest and grandiose vocal talent that draws you in with their intensity and tone. This isn't to say that Asher doesn't do well, it's just these songs feel a bit too big for his vocal capacity. I am quite proud of him, though -- as the performances are very stripped down (I suppose that's part of his character), and after only hearing his chops through the ampified and electrolyzed (new word -- you like?) V Factory, this is an interesting change. Another interesting inclusion is the mysterious cuts credited to Raney Shockne. The Louis Armstrong-inspired vocals cover Screamin' Jay Hawkin's classic "I Put A Spell On You" and the songbook classic "You Made Me Love You". The songs have this strange vintage vibe without feeling retro and still being very 2009. However, Shockne is a producer and composer, so I'm not sure who's vocals these truly are...or if they are Shockne himself? Anyone have any insight? What do you think? Are you psyched for 'Fame'?